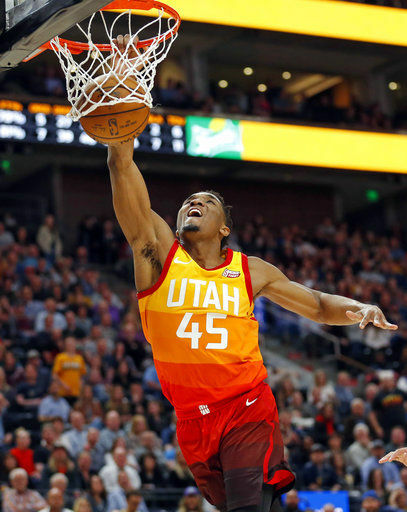 SALT LAKE CITY (AP) — Donovan Mitchell scored 25 points and previewed his Slam Dunk Contest appearance with two tomahawk jams, and the Utah Jazz extended their league-best winning streak to eight with a 106-94 victory over the Charlotte Hornets on Friday night. The streak is Utah’s longest since winning nine in a row in 2010. 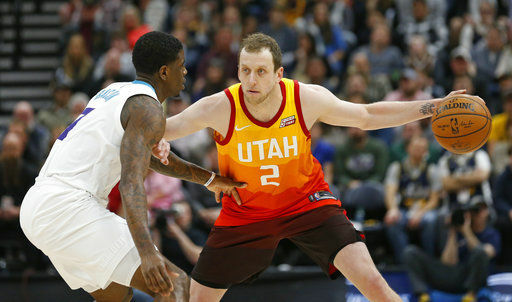 Joe Ingles scored a career-high 23 points with six assists and five rebounds for the Jazz. Rudy Gobert added 20 points and 11 rebounds. Kemba Walker scored 19 points for the Hornets, who lost three straight to conclude their four-game Western Conference trip. The Jazz withstood a 3-point barrage from the Hornets in the third quarter and closed the period with a 9-2 stretch jump-started by a cutting dunk from Jonas Jerebko. Utah extended the run to 16-5 early in the fourth for a 91-79 lead that was too much for Charlotte to rally from. The Jazz held the Hornets to 17 points in the final quarter. Hornets: Willy Hernangomez, acquired Thursday in a trade with the Trail Blazers, was inactive. … Dwight Howard fouled out with five points and nine rebounds. Jazz: Jae Crowder, acquired in a trade with the Cavaliers, was not yet available to play. He sat behind the bench in street clothes. … Ricky Rubio left in the third quarter with left hip soreness and did not return. The Jazz played their first game without Rodney Hood and Joe Johnson, who were traded away Thursday. Hood was second on the team with 16.8 points per game. He and Johnson missed a combined 37 games this season, so the Jazz were already accustomed to their absence. “You’re going to have to adapt throughout the course of the season. Whatever it is,” Jazz coach Quin Snyder said. “You may have more injuries than the other team. You may have less. You may have a roster situation, a trade. (It all) requires adaptation. Hornets: Host DeMar DeRozan and the Toronto Raptors on Sunday. Jazz: Travel to face Damian Lillard and the Portland Trail Blazers on Sunday.